- Very minimalist UI (maybe a bit too minimum). There aren't a whole lot of features or customization options. I can't open a new tab with a homepage of my choosing. No permanent status bar, just a little popup bar at the bottom when information needs to be displayed. I could use a few more buttons to the left of the address bar. Do we really need an address bar that long to fit over 100 characters? 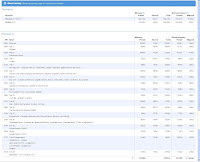 - Fast find within page feature that auto highlights. It seems a little flakey. It works fine in blogger compose mode but not in html mode. - Downloads are handled pretty well with no dialog boxes or user interactions needed. They just show up temporarily in a download bar at the bottom that is local to that tab (and even that page). - Spell checking is still spotty. It works on most sites but doesn't seem to work in Blogger in compose mode (though it does seem to work in Html mode). - Some more weird Blogger behavior. Clicking on pictures in compose mode doesn't select it. - Needs an official portableapps version. - Closing a tab goes to the last selected tab. Ctrl-Tab is almost the way I like it. Still no where near as flexible as tabmixplus on firefox (I really miss locking/protecting tabs). - No auto refresh a page at a set interval. This is useful for the ocassional woot off. - Your address bar IS your search bar. - I found flash performance pretty good which runs as a plugin in its own process. - I really like how each tab is run in a different process. 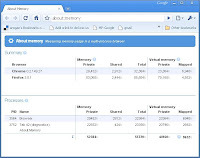 I ran a little test to see how Chrome handles memory as compared to firefox (3.0.1 portableapps version). First, I opened fresh copies of Chrome and Firefox. Next, I opened 17 different tabs with nice mix of blogs, forums, flash video sites, shopping, news, social networking, etc. in each browser. Finally I closed all the tabs except for a single simple html page tab. I took measurements of resources used for each step using the nifty Task Manager (shift esc) built into Chrome. As you can see start values were 25mb/53mb (chrome/firefox). Under load it was 268mb/168mb. After cleanup it was 32mb/85mb. Chrome does use more memory in general because of having to copy that global data between each separate process for each tab, but it's also much better at cleaning up after itself as you close tabs down. Over time you can see firefox memory footprint grow as it gets more and more fragmented in memory while I think Chrome won't have that problem. Overall I'm quite impressed with this beta. Once plugin development takes off and a few small fixes/enhancements come out, I can definitely see myself using this as my main browser.